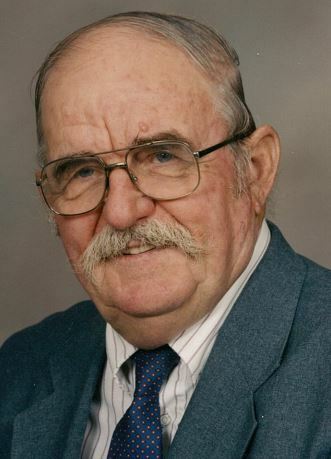 Alvin Friesen, age 93, of Newton, Kansas, passed away April 1, 2018, at Newton Medical Center. Alvin was born July 18, 1924, in Rural Marion County — the son of Abraham and Susanna (Penner) Friesen. Alvin was the 4th of six children born to Abraham and Susanna. Alvin attended school in Marion County, graduating from Hillsboro High School in 1942. He then attended Bethel College. Realizing that a college education was not for him, he went back to help on the family farm until he was drafted into the US Army in 1949. He first served in Germany – helping with reconstruction after World War II. Later, he served in the Korean Conflict for about 18 months –serving with the 439th Engineer Battalion. After being honorably discharged from the US Army in 1952, Alvin returned to farming. After several more years of farming, Alvin went to work at Hesston Corporation (now AGCO) in Hesston – where he worked until his retirement in May1988. Alvin married Anna Doerksen on February 18, 1962, in rural Meade, KS. During their 56 years of marriage, Alvin and Anna enjoyed traveling and spending time with extended family. After 12 years of marriage, they welcomed their only child, Marc, in September, 1974. The family celebrated their 50th wedding anniversary in February, 2012 – a celebration Alvin and Anna enjoyed! In February 2015, Alvin and Anna made the decision to sell their home in Hesston to move to Presbyterian Manor in Newton. Over the years, Alvin has enjoyed hobbies such as coin collecting, International Harvester toy collecting, going to auctions, attending Army reunions, and going to “coffee” with many acquaintances in Hesston. Alvin was well known for his accumulation of knowledge about different topics. In the last two years, Alvin has enjoyed “meeting” his granddaughter, Kate, two times a week as she entered Presbyterian Manor for preschool. He also has enjoyed talking with his grandson, Luke, about school and golf. Alvin and Anna are members of Whitestone Mennonite Church in Hesston, KS. Alvin has confessed his faith in Jesus Christ. The hope is that brothers and sisters in Christ will meet Alvin again in heaven. Alvin is survived by his wife, Anna, of 56 years who resides at Presbyterian Manor in Newton. Alvin’s son and daughter-in-law, Marc and Sarah, and two grandchildren, Luke and Kate, also reside in Newton. Alvin also leaves one sister, Evelyn (Irvin), of Moundridge, KS, and many nieces and nephews. Alvin is preceded in death by his parents, brothers, Carl and Theodore (Ted), and sisters, Linda and Edna. Visitation will be held Thursday, April 5, 2018, 6-8pm at Presbyterian Manor Chapel. Memorial Service will be held Friday, April 6, 2018, 11:00am at the Whitestone Mennonite Church in Hesston. Burial with Military Honors will be held prior to the service at 9:30am, Eastlawn Cemetery in Zimmerdale. Memorials are suggested to Presbyterian Manor and may be sent in care of Petersen Funeral Home. We are so sorry for your loss Marc. Please let us know if anything we can help. Uncle Alvin and Aunt Ann took ne on vacation and taught me how to water ski..I have great memories of him.. Our condolences to Aunt Ann and Mark and his family. Thoughts and prayers are with you as you celebrate your father’s life. He left a wonderful legacy.